Attributions and conjectures: Title based on the contents of the fonds. he resumed a teaching career. 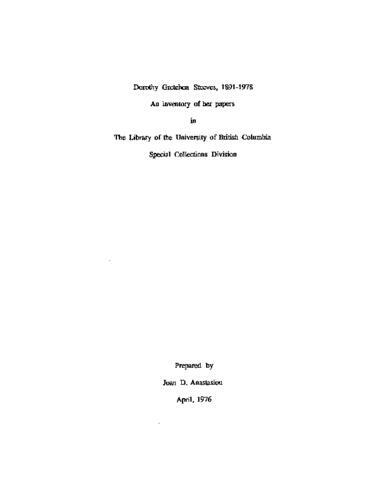 In the 1920's she became Secretary of the University Women's Club and the Leage of Nations Society in Vancouver . During the depression years she initially joined the League for Reconstruction and then the Co-opeative Commonwealth Federation,-attending the CCP Convention in Regina . In 1933 . Dorothy Gretchen Steeves was elected as an M.L.A. far-North Vancouver-in a by-election during 1934 and twice re-elected in the 1937 and 1941 elections . After her electoral defeat in 1945 she spent many years within the framework of the CCF movement serving on executives at the provincial and federal levels . she wrote The Compassionate Rebel editorials in 1960 and followed this book by Builders and Rebels : A shortHistoryof the CCF from 1932 to 1961 . Some of the organizations in which she actively participated were the B .C . Civil Liberties! Association, Canadian Institute of International Affairs, Canadian Committee for Nuclear Disarmament, Canadian Fellowship of Reconciliation, Women's International League for Peace and Freedom, Society for the Abolition of Capital Punishment, Society for the Prevention of Cruelty to Animals, Association of the Protection of Fur-Bearing Animals, and the Unitarian Church. The fonds consists of records chronicling the growth of socialism in Canada and the formation and history of the Cooperative Commonwealth Federation and the New Democratic Party, as well as with various aspects of the issues of human rights and of peace and disarmament. There is also autobiographical material and records pertaining to Unitarianism. Inventory available. PDF document attached.